Tá blitz peil gaelach ar siúl Dé Céadaoin 22/04/15 i bpáirc CLG Chionn tSáile i gcoinne scoileanna áitiúla do ranganna 4-6. Beidh ranganna 4-5 ag siúl ann ag a 09.30 r.n. agus ar ais ag a 12.30 i.n. Beidh rang a 6 ag siúl ann ag a 12.00 i.n. agus ar ais ag a 2.00 i.n. Beidh cosaint fiacla ag teastáil ó gach páiste agus tá cead acu buataisí peile a chaitheamh ach níl gá. Tá praghas €2 an páiste ar an mblitz. Clúdaíonn sé seo deoch, boinn má bhuann siad agus milseán amháin. An club C.L.G a eagraíonn é seo agus is tradisiún é rud amháin milis a thabhairt amach. Bíonn sé tuillte acu i ndiaidh blitz. 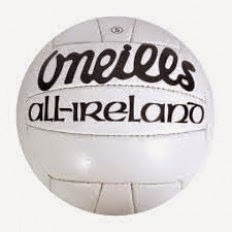 4th- 6th class have a football blitz Wednesday 22/04/15 in Kinsale GAA pitch. 4th-5th are walking to the blitz at 09.30am and returning at 12.30 pm. 6th class are walking to the blitz at 12pm and returning at 2.00 pm. Every pupil needs a pair of gum shields. Football boots are allowed but optional. Each pupil must pay €2 to participate. This covers the cost of a drink, a treat and a medal if they win. Kinsale GAA are the organisers of this blitz and it is a tradition to give one treat per player and it is well earned after all the matches. Táimíd ana bhuíoch as CLG Chionn tSáile. We are very grateful to Kinsale GAA and all involved.